The Digital Research Library of Illinois History Journal™: A Proposal to House the Entire 1893 World's Fair... within One Structure... on Lake Michigan! A Proposal to House the Entire 1893 World's Fair... within One Structure... on Lake Michigan! 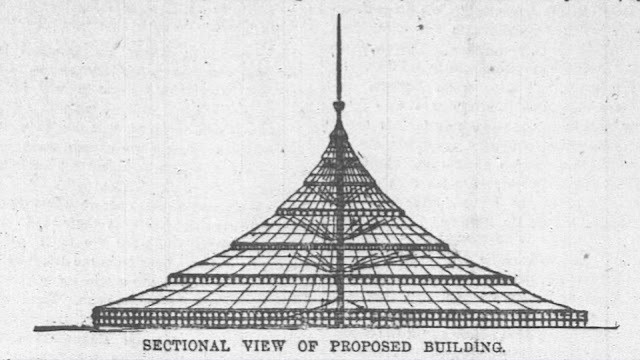 The structure (tent like) that architect Edward S. Jenison proposed for the 1893 World’s Columbian Exposition would have had to be enormous to house the entire World’s Fair. Jenison must have taken Daniel Burnham’s recommendation to "make no little plans" literally. Entrances from outside only on first gallery. Under first gallery six tracks for railroad exhibits. First gallery a grand boulevard for driveway, cafes, etc., etc. Second gallery for race track 1 3/4 miles long. Twenty-four stairways from first gallery down to main floor. Grand Canal, 150 feet wide, with 24 bridges. Picture galleries in fire-proof vaults under high part of amphitheater. Amphitheater in center, 600 feet in diameter, 60,000 seats. Jenison’s round, tent-like structure would have been 3,000 feet wide – that’s just over 1/2 mile. The center steel tower 1,492 feet high (the year Christopher Columbus landed in North America) with an elevator leading to an observatory at 1,000 feet. That’s only 8 feet shorter than the John Hancock Building's highest antenna tip! Cables radiating from the center mast to a three-story-high brick wall would support a glass and corrugated iron roof encompassing over 160 acres. An amphitheater around the center pole would seat 60,000 people. And it wasn’t just the size and height that was ambitious. 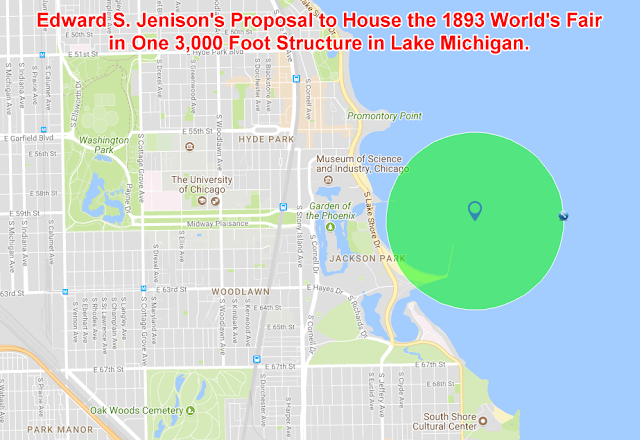 Jenison planned for the whole thing to be built, not on land, but in the lake near the shoreline off Jackson Park and supported on submerged piles. Water would be drawn up through the central tower and distributed over the roof to keep the building cool. He also included plans for an interior canal for a naval exhibit. Railroad exhibits would run on six tracks around the inter perimeter of the building. The green circle is exactly 3000 feet in diameter. Architect Jenison estimates that his building would cost $6,000,000. But in reality, it would come closer to $20,000,000 in the 1890s (that's $553,779,150 in today's dollars). Tim Samuelson, the City of Chicago's Cultural Affairs and Special Events Coordinator was familiar with this plan. He describes it as a “pipe dream” that captured a lot of people’s imagination. Jenison proposed it in the spring of 1890, when planning for the Fair actually began. Engineering experts questioned whether it was even possible to build it. Some said that in theory it might be, but most architects believed that the technology wasn’t available yet. Ultimately, Jenison’s plan was rejeted when fair Officials decided to build the World's Fair on land in Jackson Park rather than in Lake Michigan. It was deemed that a building like this would never satisfy exhibitors. as most would want to build their own structures. It would not show exhibits to the best advantage, would mix things up in an incongruous manner—artworks, statues, machinery, goods, locomotives, thrashing machines and bric-a-brac, etc., that would distract, confuse, and tire the visitors. 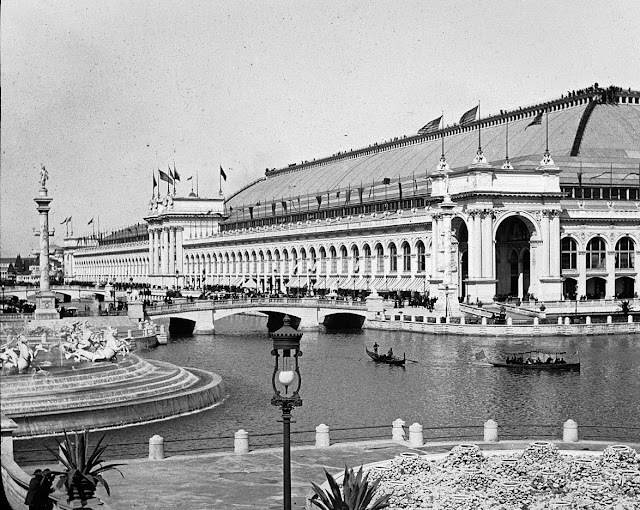 at the 1893 World’s Columbian Exposition. But the Columbian Exposition still managed to create the largest building in the world at the time: the colossus Manufacturers and Liberal Arts Building, designed by George B. Post.